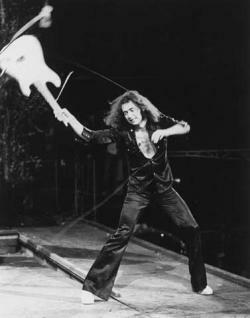 Richard Hugh "Ritchie" Blackmore (born 14 April 1945) is a British guitarist and songwriter, who began his professional career as a session musician as a member of the instrumental band The Outlaws and as a backing musician of pop singers such as Glenda Collins, Heinz, Screaming Lord Sutch and Neil Christian. Blackmore was also one of the original members of Deep Purple, playing jam-style rock music which mixed simple guitar riffs and organ sounds. During his solo career, he established a neoclassical metal band called Rainbow which fused baroque music influences and elements of hard rock. Rainbow gradually progressed to catchy pop style hard rock. Later in life, he formed the traditional folk rock project Blackmore's Night transitioning to vocalist-centred sounds. Their latest album, Dancer & the Moon, was released on June 2013, which entered at # 189 on USA's Billboard Album Charts.